PennsylvAsia: “In the Shadow of Working Men: Gendered Labor and Migrant Rights in South Korea" at Pitt, April 3. “In the Shadow of Working Men: Gendered Labor and Migrant Rights in South Korea" at Pitt, April 3. 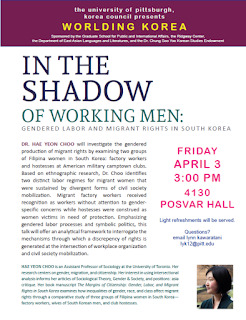 The University of Pittsburgh's Asian Studies Center will host Dr. Hae Yeon Choo of the University of Toronto and her talk “In the Shadow of Working Men: Gendered Labor and Migrant Rights in South Korea" on April 3. This talk will investigate the gendered production of migrant rights by examining two groups of Filipina women in South Korea: factory workers and hostesses at American military camptown clubs. Based on ethnographic research, I identify two distinct labor regimes for migrant women that were differently shaped in the shadow of working men. Divergent forms of civil society mobilization in South Korea sustained these regimes: migrant factory workers received recognition as workers without attention to gender-specific concerns while hostesses were construed as women victims in need of protection. Thus, Filipina factory workers were able to exercise greater labor and social rights by sharing the dignity of workers as a basis for their rights claims from which hostesses were excluded. Emphasizing gendered labor processes and symbolic politics, this talk will offer an analytical framework to interrogate the mechanisms through which a discrepancy of rights is generated at the intersection of workplace organization and civil society mobilization. The talk will be held from 3:00 pm in 4130 Posvar Hall (map) and is free and open to the public.